It has been too long!! Trying to get back on track to posting once every week or so. So to catch up let's chat about our first group project. We have started and finished our first group project. Our idea: Day With Your Dog. It is a website that gives you all of the information you need to spend an entire day with your dog outside of your house. My team members and I really like this idea and found a need for it in the marketplace, so we continue working to iterate and improve on this idea even after we move on in class. Read on for our mission, the problem it solves, and our minimum viable product and more. In a world that is increasingly more dog-friendly and since they are man's best friend why not take them everywhere. Our mission is to provide a one-stop shop where dog owners can plan their day with their dog. Our group all own dogs (see 'Our Inspiration' on our website) and while brainstorming we thought hey wouldn't it be convenient to have a place where you could go to plan an entire day where your dog can join too? That is how Day With Your Dog was born. Additionally, the day before my wife and I were trying to find a restaurant where we could bring our mini-schnauzer but had trouble finding one quickly and efficiently. Our target audience is anyone who has access to the internet, owns a dog and wants to bring them everywhere! There is on solution out there that is in direct competition with our app. That solution is BarkHappy. In fact, they are also based here in Austin, TX where we are based. With BarkHappy you can find other dogs nearby, explore dog-friendly places and events, host your own group play dates and it also gives lost and found alerts. One con to BarkHappy is that it doesn't currently have a website that has the same functionality that their app does. Additionally, it appears restaurants are only added by users and don't take advantage of existing reviews from Google or Yelp. 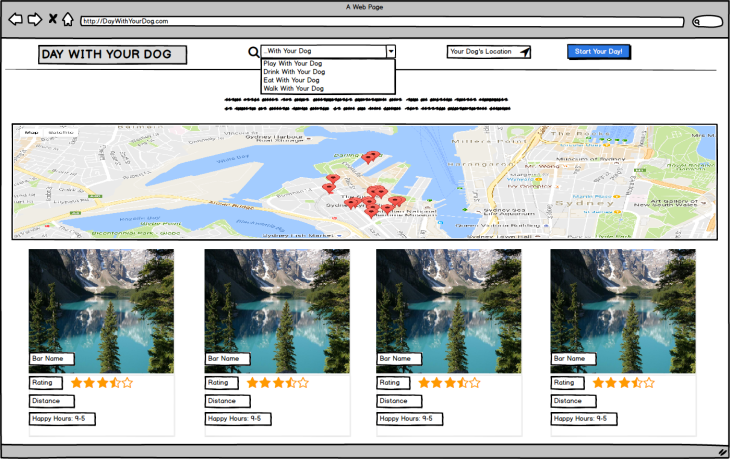 There are also a few other solutions including Dogvacay and Rover but they are more specialty type apps. With any new product, there are assumptions that you make and we need to test. I think the biggest assumption we are making is that there is a need for our service and that people will use this app. We are also assuming that our application will fill a gap in the market that doesn't currently exist. How will solution test assumptions? * We will test this assumption through user test cases and feedback. Based on the results we will incorporate any user feedback in furture iterations to help make our product more user-friendly. * There are currently other products in the space so we will need to work to differentiate our product offering enough or do it better than the current provider. Based on user feedback and as our technical skill set grows we will be able to position ourselves for success. As will all initial releases of Minimum Viable Products our assumptions will most likely change after user feedback is received and may change the course of our product altogether. As such we need to be prepared to shift our focus. In addition to assumptions, there are also personal risks. For me, I think the biggest risk to complete this application is the knowledge of how to make this a commercial grade application. For example, I currently haven't had any experience with user authentication and integration of map routing through Google. While this isn't a problem currently as we do not have a user section, I think this is a very important piece that will allow for success in the future. With time, however, I will be diving into these limitations and will then have the opportunity to upgrade our application. 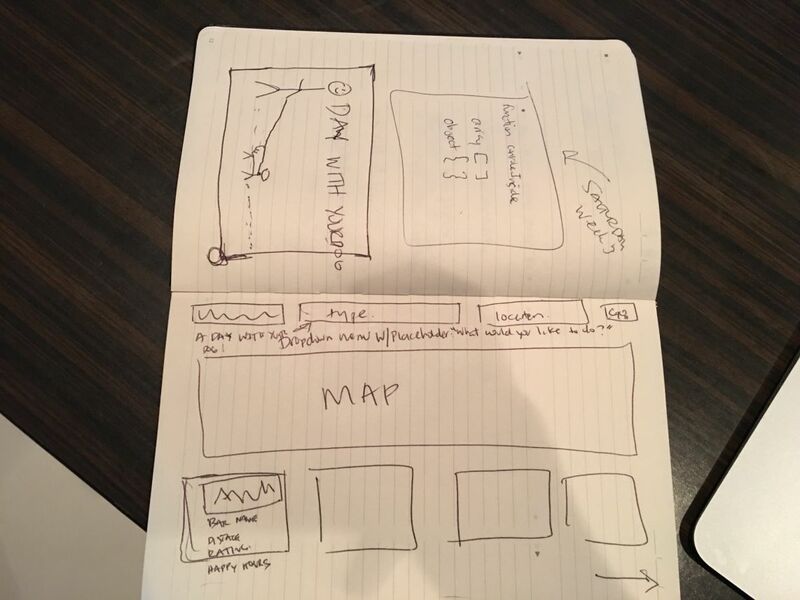 To get a better understanding of what we would be building we created a wireframe. I mocked this up quickly using the wire-framing software Balsamiq. As you can tell the first deliverable is much different but this process helped us to narrow down the functionality of what our app would do. Here is a brief walkthrough of how our app works. To plan YOUR DAY WITH YOUR DOG click here: Day With Your Dog (limited to only Austin at the moment). While these additional implementations would be great we need to wait to see what the user feedback reveals and we have to be careful of scope creep (when you have too many features). All content copyright The Finley Code © 2019 • All rights reserved.